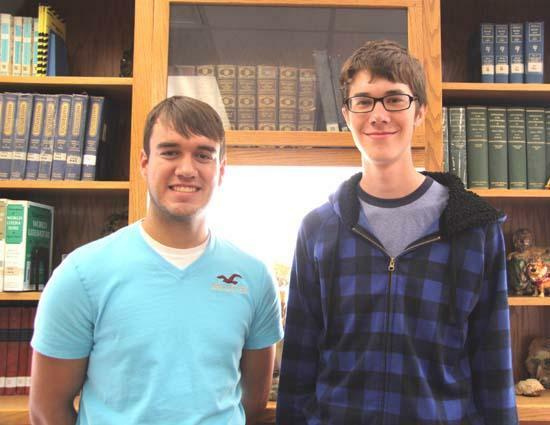 When Damian Coomes and Jordan Blackburn address their graduating classmates during 2011 commencement exercises at Cannon County High School Friday they will have a wealth of knowledge to share. Coomes, the 2011 Valedictorian, and Blackburn, who is Salutatorian, likely will spend more time talking about lies ahead rather than what has been achieved. "My speech is non-existent right now," Coomes said last week, when asked for an insight into his speech. "I've mainly been focused on college and what is next and deciding which path I need to take." Blackburn had not started putting words to paper last week but he did have an idea of where he would be going. "I most likely will talk about how far we have come and how far we still have to go," Blackburn said. "High school has been such a great experience. I would not trade it for the world." Coomes says he has been too busy concentrating on the future to dwell on either the past or present in the interim. "I've mainly deciding which path I need to take," said Coomes, who will be attending the University of Memphis. "I'm undecided on my major so I'm going to take most of my general classes, some electives, during my freshman year and then decide which path I want to take." Nontheless, Coomes says he does realize the value of his high school, as well as grammar school education. He attended Short Mountain Elementary. "High school was a good experience," Coomes said. "It was much different from grammar school where it was self-contained. It was definitely a good step. I really have not thought much about what I will miss. I will figure that out later." Blackburn, who will attend Tennessee Tech, said much of his life has been formed at Cannon County High School. "There are some teachers who really had an impact in my life and academics, and I will miss them because they played a part in who I am today," Blackburn said. "There will be friends and certain things that I will miss but at some point everybody has to move on. There are always things to miss but there are also things to look forward to." Blackburn said his time at Cannon County High School has transcended education. "Not only have I learned many things, knowledge wise, but many other things," Blackburn said. "I notice how much I've matured since I was a freshman and how much I've gained. It prepares you to be an adult and it prepares you for the responsibility you have to hold in college." Cannon County High School will conduct commencement exercises on the football field at CCHS Friday at 7 p.m.